People find this place rather nice! Average score: 5.1 by 1029 random voters. 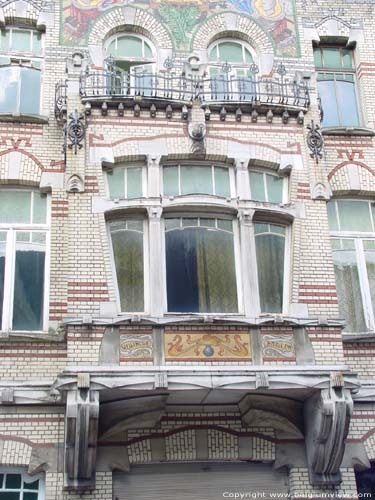 This gentleman's house is a creation of Frans Smet-Verhas in art nouveaustyle. The facade was mostly built symmetrically . At the left side, the facade is flanked with guerite tower but it has been sadly taken awy meanwhile. In the facade we find the for this style so typical, eastern looking , horse shoe arch back around the windows under the wall mosa�c. Look especially to the projecting window with there above a terrace finished with a wrought iron breastwork. The projecting window has a De erker bevat een cuneiform window in three parts from which event the posts are worked out with style. The attic of the facade had until a few years ago a couple of originally formed crenelation in nature stone which have in the mean time also disappeared . They are an evocation of the medieval castles. In the mosa�c you can find back the name of the house as well as the portraits vof Napoleon and Wellington.